Every morning and every night, you head to the bathroom to brush your teeth. Sparkling white teeth are great, but did you know that your toothpaste can do a lot more? It’s handy for everything from cleaning to hanging a picture straight… Seriously! 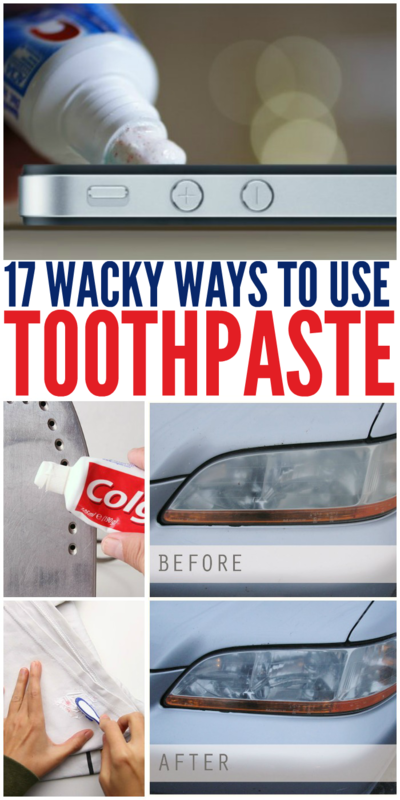 Check out these 17 ways to use toothpaste for some minty fresh surprises. Remove tiny scratches from your smartphone screen. A little dab of toothpaste on a q-tip will do. Get that haze off your headlights with a bit of toothpaste and elbow grease. Dab a little on a pimple the next time you get one. Not recommended for sensitive skin! Remove dry blood from clothes. Skinned knees and scraped elbows are inevitable when you have kids! Over time, your iron gets dirty and grimy. Make it spiffy again with some toothpaste. Hang posters with a dab of toothpaste if you’re worried about leaving marks or nail holes in the wall. Fix scratched CDs with a touch of toothpaste and a soft cloth. Use toothpaste to make your jewelry shine. It can even help you clean crayon marks off your walls. 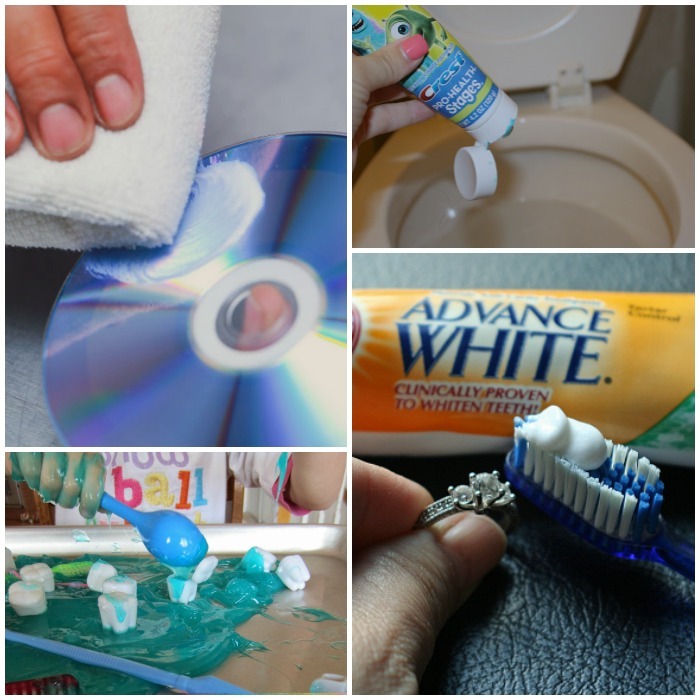 Make a toothpaste sensory tray to get your kids excited about dental health! Clean your toilet bowl with toothpaste if you prefer the smell of a minty fresh potty instead of that chemical smell. Polish old silver to make it look like new again. 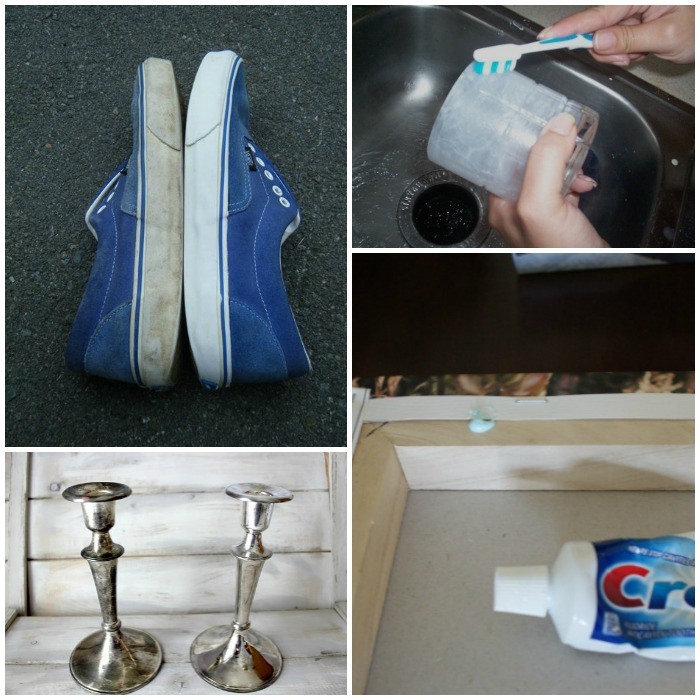 Clean your dirty sneakers with an old toothbrush and some toothpaste. It really works! Put toothpaste on the backs of pictures to mark on the wall where you want them hung. Clean cloudy glassware with toothpaste and a toothbrush to get it crystal clear again. White toothpaste can remove water rings from wood furniture. Who knew?